"Everything that goes to what this game is…is everything that this group talked about wanting to accomplish since the day they arrived on campus." 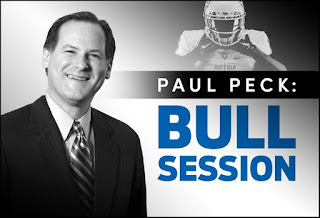 Lance Leipold's words sum up what's at stake for the Bulls Friday at Bowling Green. It also sums up why he isn't worried about his team's motivation and attitude. A win clinches the MAC East title, and puts UB in the MAC Championship game in Detroit against Northern Illinois on November 30. What happened in Ohio last week means nothing. It was quickly forgotten after the loss, with the focus squarely on Bowling Green. The players know what's at stake. They know they have the benefit of controlling their destiny. Bulls senior linebacker Jordan Collier is ready. "Our mindset is to go out there and win no matter who it is. Big games make me play better. I might be nervous, but after that first snap, I'm locked in and ready to go. Go out there and just play." Bull Session Trivia: The last time the Bulls played at Bowling Green with a chance to win the MAC East was 2008. Trailing by 20 points in the fourth quarter, the Bulls won the game 40-34 in the second overtime, on a James Starks 25-yard touchdown. Who scored the Buffalo touchdown with :37 seconds left to force OT? Kevin Mark's touchdown run against Ohio was the team's 28th rushing score of the season. That set a new record. The 2008 team held the previous mark of 27. The Bulls are also in range of the team's total touchdown record. That mark is 55. This year's team has hit the end zone 52 times…A big offensive outburst against Bowling Green will also set a new team record for points. The current mark is 45 points away…Tyree Jackson's 55 yard run vs. Ohio now gives him 162 yards on the ground in his last six games. He's scored seven times in that span…The Ohio game was the first this season in which Jackson did not throw a touchdown pass…Last year against the Falcons, Jackson threw for a career-high 406 yards…Anthony Johnson, despite missing most of three games, remains second in the MAC in receiving yards and tied for first in receiving touchdowns. He's averaging 19.4 yards per catch, good for 16th in the country…The Bulls have allowed only eight sacks all season. That leads the MAC, and ranks 4th in the NCAA…With a big game, Jaret Patterson can challenge the Bulls freshman rushing record. Aaron Leeper had 917 yards in 2002. Patterson is 131 yards away…The Bowling Green defense has struggled to stop the run all season long. They allow 278 yards per game on the ground, and 5.9 yards per carry. Those numbers rank last in the MAC, and 3rd worst in the NCAA. They have allowed 10 runners to go over 100 yards in a game. But none during their current two game winning streak…The Falcons are last in sacks, and 10th in third down defense…But there has been significant improvement lately. After allowing 35 points and 400 yards per game in the first eight contests, those numbers are down to 18 points and 256 yards in the last three games. "They found some ways to be disruptive, and they're getting turnovers and stops when they need them," says Leipold…Keep in mind, those three games came against opponents (Kent State, Central Michigan, Akron) who rank 8th, 11th & 12th in the MAC in scoring…Some of the troubles stopping the run are due to an extreme lack of depth on their defensive line. Last week in the win over Akron, the Falcons played only four D-lineman. No subs. That amazing feat was highlighted by the line combining for four sacks and six tackles for loss. Word is BG will get some backups healthy this week and will be able to play more than four. But even so, they are small up front. No Falcons defensive lineman is listed as more than 279 pounds…LB Brandon Harris is the leader of the defensive group. His 112 tackles rank 4th in the MAC…They have very good safeties in Jerry McBride and Marcus Milton. Cornerback Clint Stephens is one of the MAC's best. The other starting cornerback, senior Montre Gregory, will miss the first half due to a targeting call against Akron. Bullet Points: 400. Linebacker Khalil Hodge is one tackle away from the 400th of his UB career. He'll be the fourth player in school history to reach that milestone, but the first to do it three seasons. After he gets number 400, three more will move him up to 3rd on UB's all-time tackle list. Hodge continues to fill spots among the conference and national leaders in tackles. 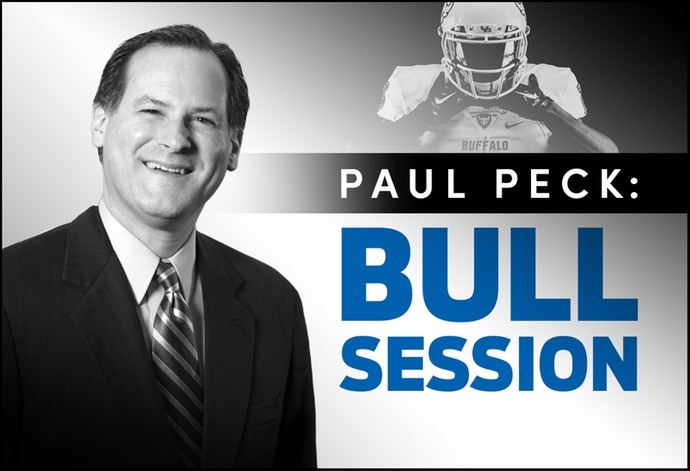 He's 2nd in the MAC, and 11th in the NCAA…The UB defense fell from 1st to 4th in the MAC defensive yardage rankings after the game against Ohio…The Bulls are 3rd in sacks, and they've had one in every game this season…The pass defense gives up only 177 yards per game, that's 14th in the country…Safety Brandon Williams had a career-high 11 tackles against Ohio…Depth at the cornerback spot was on display again for the Bulls. Redshirt freshman Wankieth Akin, playing a nickel back role, had some big stops in the secondary…Backup linebacker Matt Otwinowski will wear Solomon Jackson's #41 in this week's game…The Falcons have the top QB-WR duo in the MAC. QB Jarrett Doege is the conference leader in passing yards and touchdown passes. WR Scott Miller leads in receiving yards, and sits second in catches. "Two excellent football players," says Leipold, "Miller's played a ton of football. They're both dynamic. "…Doege has also thrown the most passes, and most interceptions, in the MAC. He can be streaky, evidenced by his game last week against Akron. He started 3/10, then completed his next 15 passes. Last year against UB, Doege threw for 294 yards and three touchdowns…Miller is the MAC's only 1,000 yard receiver. He's a fast, quick, precise route running senior who's had a catch in 35 straight games…Fellow wideout Quintin Morris is a big, six-foot-four red zone target who's scored seven touchdowns…Tight end Dorian Hendrix has caught a touchdown in three straight games…Nine different players have caught touchdown passes for BG this season…Running back Andrew Clair is the MAC's 6th-leading rusher. He's quick and fast, and averages over five yards per carry…The Falcons will use a second QB, Grant Loy, to come in and run the read option. Loy has 24 carries this season, and only 11 passes. He's been busy lately, with 21 runs in the last three games…The Falcons have been outscored 217-130 in the second half of their games. Maybe it's because these two teams usually play late in the season. Maybe it's because Bowling Green has been the class of the MAC East for most of the last ten years. But it's an interesting twist that it would be the Bulls needing to beat the Falcons for the division title. It's the third time UB will play a "division championship" game, and the third time it will come against BG. As mentioned in the trivia question above, it first happened in 2008. It was the second-to-last game of the season, and the Bulls needed to win at Doyt Perry Stadium to clinch their first title. It was a cold 26-degree night, and the game was wild. The Falcons went up 27-7 early in the fourth quarter, before the Buffalo comeback began. It featured a successful onside kick by A.J. Principe. UB tied it late, and both teams scored in the first overtime. The UB defense forced a stop in the second OT, and then Starks' run won it. It was an incredible scene of celebration, as the program hit a new high with their first division title. In 2013, it came down to these two teams again. It was the last game of the season, and it was played at the Buffalo Bills' Ralph Wilson Stadium. That had been planned before the season started as a Black Friday Battle. Bowling Green was the MAC's dominant team, and would go on to win the MAC Championship. The Khalil Mack-led Bulls battled, but too much running and throwing by BG QB Matt Johnson led to a 24-7 Falcons win. So these two teams have played twice with the division championship on the line, and the road team has won both times. Bull Session Trivia Answer: Drew Willy connected with Naaman Roosevelt on a five-yard touchdown with :37 left to tie the game 27-27 and force overtime.